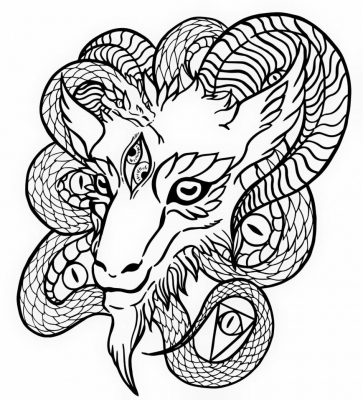 This is a tattoo design of Baphomet! A beloved god. I can color it however you'd like for an additional payment but if you like the line-art you can always get that! Hey guys! I am Miko! I love dragons, puppies and all things monsters. I would say I have a very different varieties of styles. I can help you guys design your tattoo, help you draw a monster you have always wanted to see drawn out or anything silly and cute. I can do line art, concept art, tattoo designs, fan art, cartoons, character designs. I can also dress up in a cosplay and model for you as well! I will take the pictures with my DSLR and photo retouch them! All your dreams will come true! I do not do realistic face portraits, car decals and definitely will not photoshop your ex-girlfriend's face on a garbage can. I just need a detailed description of what you would like from me and be as colorful as you can be. Write anything that comes to mind from this commission. The more details I have the better the quality will be. "Some drawing of an animal" is not very helpful. Unless that is REALLY what you wanted. If it's a character that you wanted drawn out, please give me description such as coloring, what the animal or creature is, what pose you'd like. It's personality as well! I'd love to read about it's background of course! My prices really vary on what the art work consists of. Generally simple line art will cost less and very colorful and detailed pieces will cost more. Each project will cost different so please feel free to message me about pricing!